We’re committed to selling high-quality products we hope you’ll enjoy using but we also know that, for one reason or another, there may be a time when you need to exchange or return something you’ve bought. Please make sure that you check your items carefully before they are used or installed. You are entitled to cancel your order and return the goods within 7 working days for a full refund, excluding the cost of delivery. Do this by contacting us by email or telephone and quoting the order number supplied to you. Your refund will be paid within 30 days. You are responsible for the cost and risk of loss or damage when returning the goods, so you should take out enough postal insurance to cover their value. This cancellation policy does not affect your rights when we are at fault – for example, if goods are faulty or misdescribed. Any goods returned should be in saleable condition. This means that all items must be unused and with all labels in their original packaging. If you have placed an order with us, then change your mind you will need to contact us as soon as possible. We may be able to cancel it if it has not been dispatched yet. The best way to contact is by phone on 01892 525976 between the hours of 9am – 5.30pm. You can email shop@jeremyshomestore.co.uk if it is out of these hours. Do not message us through our social media pages, as these are not always seen straight away. If your order has already been dispatched and you still wish to cancel it, you will then have to return it back to us. We reserve the right to not refund you for postage costs. What happens if I have made a mistake on my delivery details? If you have entered the wrong delivery address at the checkout page then please contact us as soon as possible as we may be able to amend it if the order has not been dispatched yet. However if the parcel has already be sent, and consequently ends up elsewhere, we will be unable to offer a refund. We can assist with trying to track the missing parcel, or if it is returned to us we can resend it after receiving a postage payment. 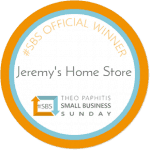 Please call 01892 525976 between the hours of 9am – 5.30pm or email shop@jeremyshomestore.co.uk. What happens if my items are damaged/faulty? On the very rare occasion that your item(s) arrive and have unfortunately been damaged or are faulty in any way, please call us on 01892 525976 to discuss the matter and we will make arrangements accordingly. How do I return items to store? You can return item(s) to use in store at 26-28 Monson Road, Tunbridge Wells, TN1 1ND. You will need a copy of your order confirmation or dispatch note. This can be shown from your email on your phone or as a printed copy. Please return all items to 26-28 Monson Road, Tunbridge Wells, TN1 1ND. Items returned by post can take up to 10 working days to reach us once you have posted the parcel. We do not cover the cost of the postage to send us items, nor do we issue a refund for any postage you’ve paid for. We cannot accept any liability if your item(s) get lost in the post when sending them back to us.